The primary mission of Belknap-class was to provide anti-air (AAW) and anti-surface (ASUW) defense for aircraft carrier task force. Her secondary missions were to provide defense against submarines (ASW) and to conduct shore bombardment (NGFS) in support of amphibious operations. Designed to operate at high speed for extended periods of time in support of long range Battle Group operations, the Belknap-class was fitted with air search radars and a weapons direction system that uses digital computers. This system processed data on air targets and feeds it to the missile fire control and launching systems in order to aim and fire extended range standard missiles at any attacking aircraft or missile. 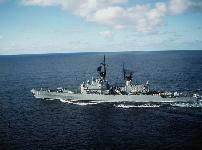 The Belknap-class was equipped with long range sonar which provided data to the underwater battery fire control system. The ASW armament included Anti-Submarine Rockets, Light Airborne Multi-Purpose helicopters, and torpedoes. 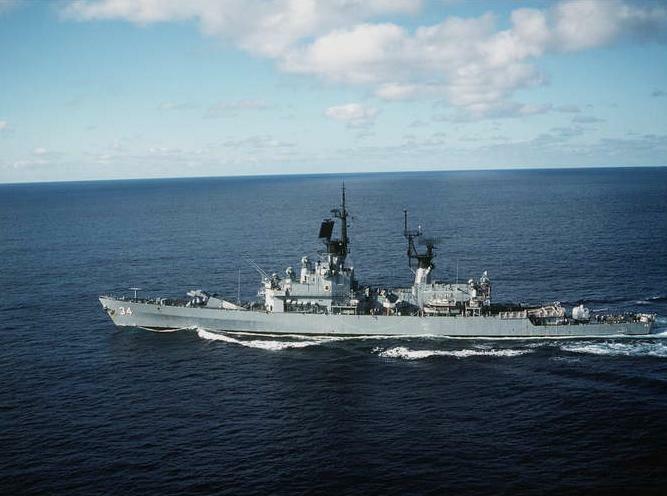 They were also equipped with a single dual-purpose rapid fire five-inch 54 caliber gun for defense against air and surface attacks as well as for NGFS. Other armament included two 20mm Gatling guns (CIWS) for close-in air defense, the HARPOON surface-to-surface missile system for use against enemy ships over the horizon, and the Super Rapid Blooming Offboard Chaff (SRBOC) for use as a decoy. Originally classified as Guided Missile Destroyer Leader [DLG] these ships were reclassified as Guide Missile Cruisers in 1975. The comprehensive New Threat Upgrade (NTU) included combat system capability improvements to the ship's Air Search Radars (SPS-48E and SPS-49), Fire Control Radars (SPG-55B), and Combat Direction System (CDS). These improvements provided an accurate means of coordinating the engagment of multiple air targets with SM-2 Extended Range missiles. During the NTU overhaul, all spaces were renovated, berthing and food service areas were refurbished, and the engineering plant was fully overhauled. 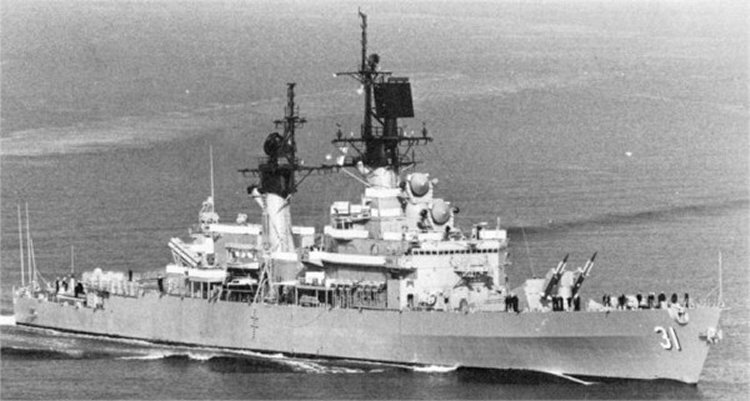 Although the Belknap-class cruisers had only recently acquired these new capabilities, they were retired in the early 1990s after roughly 30 years of service.